Hang Tags is rated 3.9 out of 5 by 10. Enrich and engage your customer in a complete experience of your product. "We started with PrintPlace.com years ago simply for business cards and single sheet flyers. It is very easy to order jobs with PrintPlace.com, and prices are very competitive, so we have expanded and now use PrintPlace.com for numerous products, including, brochures, table tents, thank you cards, greeting cards, and more." Brent Albrecht, To Eleven Marketing, Ltd. Rated 5 out of 5 by Crazyman from Easy an convenient Easy to design and view I’ll use this site again. Rated 5 out of 5 by Jackie27 from Hang tags Great job! Exactly on schedule and turned out great! Vivid colors Thanks! Rated 5 out of 5 by MichelleMarketing from These turned out great! They were just what I needed, great price and the print quality was perfect. 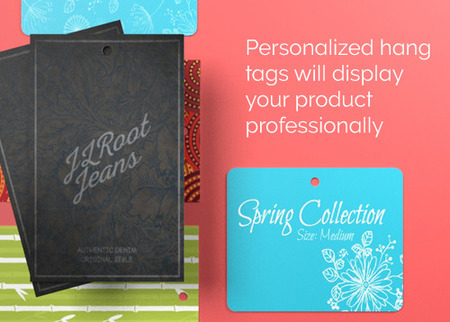 Hang tag printing provides another unique branding opportunity for every retail entrepreneur. A distinct price tag can instantly sets your piece apart. Choose from our wide range of sizes, different shapes, and premium cardstock options to stand out in today’s competitive market. 2"x 3.5" is the same size as a standard business card for rectangle hang tags and also the dimensions for the oval option. 2"x 4" is slightly bigger than the standard custom hang tag, providing space for additional information and special care instructions. 2.5” is our dimension for circle hang tags for a more out-of-the-box approach. Choose from three premium cardstock materials that provide a substantial feel and standout finish to your custom tags. Double sided printing in matte, gloss, or high gloss UV. Protect both sides with a matte, gloss, or high gloss UV coating. Choose an uncoated surface for an elegant, natural touch. Apply an elegant matte or a shiny gloss to emphasize the entire design. All our coating options highlight the important details on your custom tags. Matte is our smoothest, easiest-to-read surface. Perfect for a subdued rustic or vintage tag design. Gloss makes every color pop and gives off a distinct shine that bring attention to images. High Gloss UV offers a higher reflectivity and greater vibrancy than gloss and additional protection against abrasion and scratches. Uncoated back is the alternative for luxurious, high end brands. We offer four small and large hole size options. Select a size that would make tying the string easy for each hang tag. 1/7” is the standard, followed by the 1/4” and the 3/16” size. The biggest hole is at 5/16”. Top Center is the conventional choice for price tags with logos or designs read from top to bottom. Top Left works for a vertically oriented design, shifting the customer’s focus on a logo or company in the center of the hang tag. 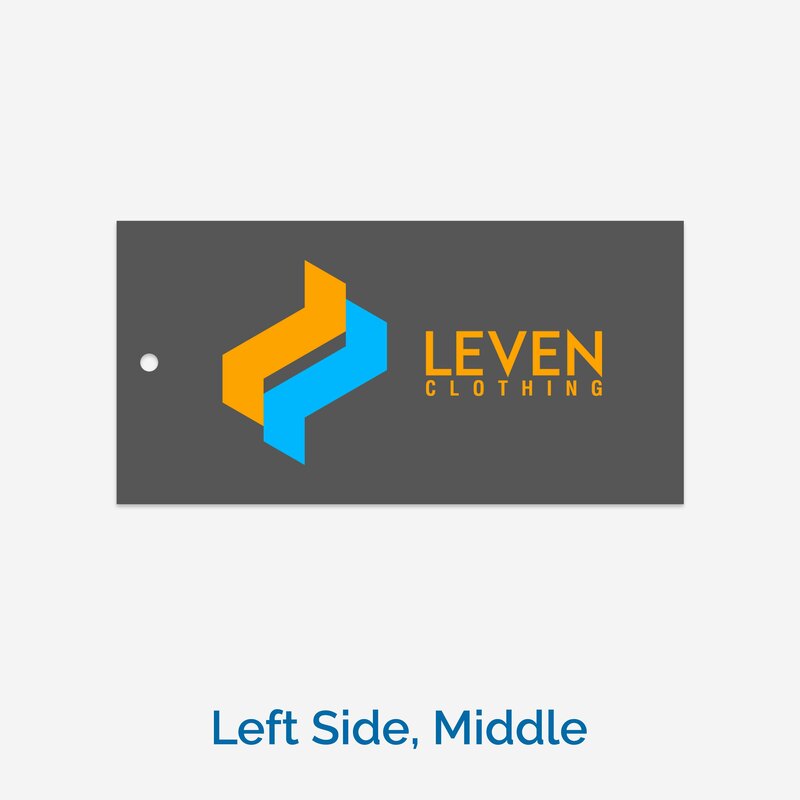 Left Side, Middle is another option for longer, horizontally oriented clothing labels that focus on the logo or company name. Left Side, Bottom works for hang tags that will be attached to packages, shifting the focus on the logo or main design. Which is the best cardstock and coating option for my hang tags? Your choice will depend on the branding message of your product packaging. 14 pt. gloss or matte, uncoated back lets you showcase an image or helpful graphic about the product on the front and list down important contact details on the writable surface. 14 pt. gloss or high gloss UV on one or both sides is perfect for highlighting branding elements such as your logo on the front and then product related information on the back. 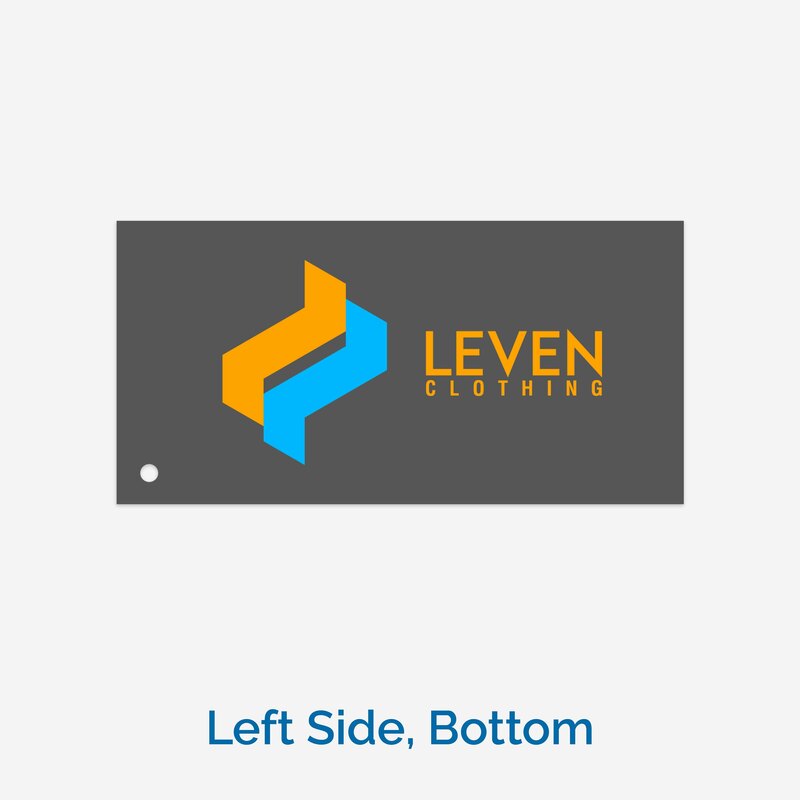 Left Side, Middle is another option for longer, horizontally oriented clothing labels. Do the printing turnaround times for custom hang tags include shipping to the indicated address? Our printing turnaround time for refers to how long it takes to produce your custom hang tags. Printing does not include the shipping time and only occurs on business days. 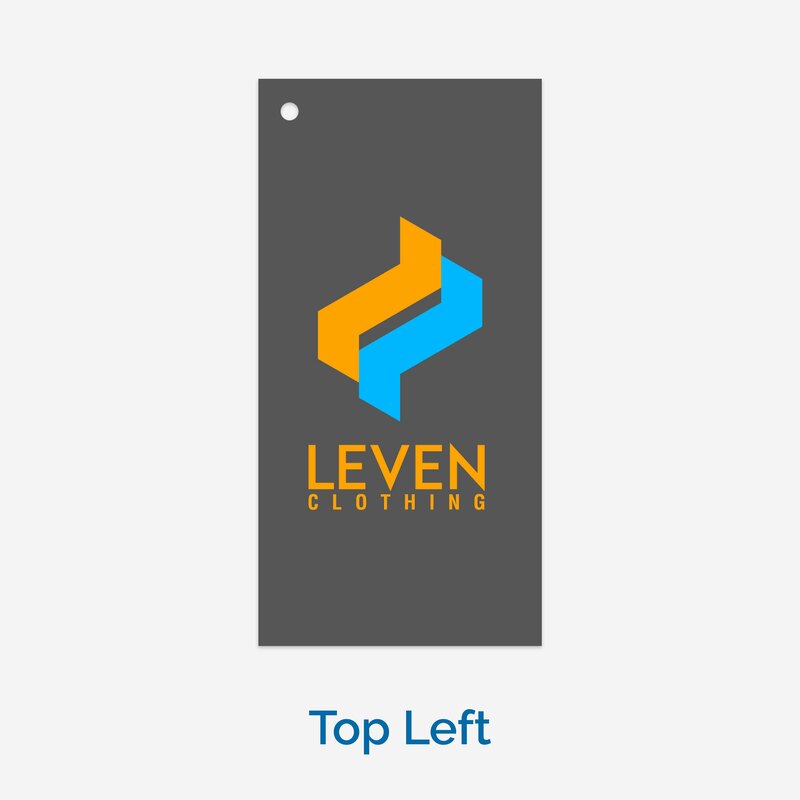 When designing your product tags or hang tags, start with one of our free layout templates. Hang tag templates are provided in EPS, JPG and PDF formats in both landscape and portrait orientation. The hole position will be shown on the PDF proof per the size and location you specified on your order. Print on both sides to give a concise yet comprehensive brief on your product. The front can showcase the product in use through a photograph or infographic, while the back can reinforce your credentials. Are you a “green” company? Is your product made in the USA? Highlight this information to enhance your image. Use a decorative design during the holidays. Entice customers to give your items as gifts on Christmas or even on special days like Valentine’s. Give your tag design an additional function. Custom hang tags can also be printed as event badges or passes on gloss paper stock. There is no additional setup cost often associated with printing on plastic or other materials. Since hole drilling is included in the price of our hang tags, all you need to do is insert a lanyard.